Sony put some of their Zeiss lenses on sale again from $50-$200 off. The 18mm Batis should be of particular interest to wide angle lens fans. You can find a list of E-mount lenses on sale at B&H Photo. 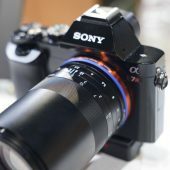 Some new images of the Sony Zeiss Loxia 85mm f/2.4 from Photokina courtesy of B&H Photo. I’d really like to see how it fits in the Zeiss Loxia Bundle with 21mm, 35mm, and 50mm in the Loxia case.